Trail camera enthusiasts are up for another surprise brought by the latest trail camera having the best and most convenient features to make wildlife documentation a remarkable one. The Bestguarder Waterproof IP66 Game and Trail Hunting Scouting Camera takes pictures with a quality of 12 MP. Users may also opt to lower the quality of the picture to 8 MP, 5 MP or 2 MP to help them occupy lesser memory in the SD card and capture more pictures. High-quality full-color resolution photos are also taken by this camera even in a fast sequence, as the Bestguarder HD camera has the capacity to capture 1-9 photos per trigger, with the trigger speed of 0.6 seconds. Aside from this stunning capacity, the trigger is also made convenient for its users since it is activated through motion sensors which capture the moving object or animal once detected—all made possible by the camera’s highly-sensitive PIR motion sensor. With its 36 IR LED, full-colored and high-quality photos and videos during daytime can be taken with this camera. Black & White photos and videos taken during night time are also guaranteed to be of the same high quality as the ones taken in broad daylight. Even movements from 75 feet can be detected and recorded through photo and video during night time, all made possible by its effective and efficient sensor. These photo and video recordings have motorized ICR, offering users with high quality still photos and videos with HD visual and audio quality. On top of that, the night sensor illuminates the photos and videos, making them clear and bright for the users to view. The PIR camera has different modes which the user can utilize for their documentation of the wild. Among these modes include Camera, which is responsible for capturing photos and videos which has an evident implication of its function, Camera + Video, which allows the user to take photos simultaneously while taking a video; Time Lapse with a maximum of 60-minute picture delay and Motion Detection. On top of these features, users can also enjoy sole and secured control of the camera with the help of its password protection feature. The Bestguarder HD Camera requires 8 pieces of AA batteries which are not included in the package and needed to be bought by the users separately. During its entire period of functioning, regardless of the modes chosen by the users, they can take up to 40000 images in the wild. On top of these features, users can also enjoy sole and secured control of the camera with the help of its password protection feature. The Bestguarder HD Camera requires 8 pieces of AA batteries which are not included in the package and needed to be bought by the users separately. During its entire period of functioning, regardless of the modes chosen by the users, they can take up to 40000 images in the wild. The multiple modes of the camera provide flexible options for different purposes and functions which the users may find helpful in their course of documenting the life in the wild. It is also a convenient feature since they can opt to have photos and videos taken all at the same time. The highly-sensitive PIR motion sensor is also a feature that makes wildlife documentation a convenient experience since capturing becomes automatic once a living creature is detected within. There is no need for the user to be present at the moment of action, leaving him or her with more time to do things other than observing the wild and sometimes finding himself or herself waiting for a long time or even for nothing. The adjustable megapixel feature of the Bestguarder HD Camera offers an option for the users to lower the quality a little bit without much difference in resolution and capture more photos. Since photos taken with smaller megapixels occupy lesser spaces in memory cards, they can capture more photos and videos for reference and documentation. The highly-sensitive PIR motion sensors can also serve as a disadvantage, as it can take unnecessary photos, which can take up space in the memory card of the camera. With sensors having sensitivity like that, possibilities of recognizing strong winds as movements of living things are always present and sometimes inevitable. It is a disadvantage since, as mentioned, it can occupy the memory card with unnecessary and not-so-helpful photos for the user. n today’s technologies available and with the other items like this camera available in the market, 36 IR LED is still somewhat lagging behind with its competitors, as there are other cameras offering more LED lights with them. 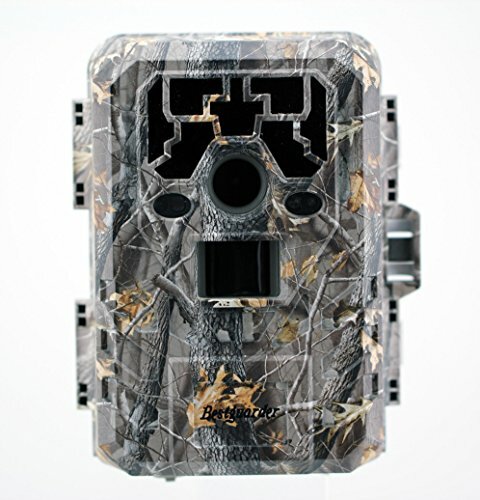 However, if you are only beginning in the world of Trial cameras and wildlife documenting and are on a tight budget, this trail camera unit could offer a good jumpstart for you. Overall, the camera has promising features and flexible option suitable for all skill levels, purpose for documentation and desired mode. It can be used by whoever and whenever and has easy-to-use and efficient features which you can utilize and change from time to time. This item ships only in selected areas, so be sure to check out whether the supplier or dealer ships within your area.